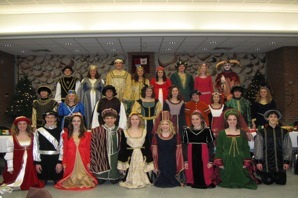 Hear Ye, Hear Ye, tickets go on sale October 15th at 7AM for the Palmyra-Macedon Select Choir’s Annual Madrigal Dinner! Don’t miss your opportunity to attend this wonderful event! If you’ve ever attended the Madrigal Dinner then you already know what a wonderful treat is in store for your ears as well as your palate! And for those who have not yet attended this highly popular event, be prepared for an evening (or afternoon) of outstanding a capella music from one of our area’s most accomplished high school choirs. While your ears are enjoying their feast of festive music, you will be served a delicious family style dinner complete from appetizer to dessert. This year’s dinners will take place on Saturday, December 11, 2010 at 6:00 PM and Sunday, December 12, 2010 at 2:30 PM in the Pal-Mac High School cafeteria. Comic interlude will be provided in the form of a fully costumed dinner theatre performed between the courses of the meal. As a special bonus, and for your gift giving pleasure, handmade crafts and ornaments will be available for purchase in the lobby before and after each performance. All proceeds from this event will go directly toward funding the activities of the Pal-Mac Select Choir. Tickets are limited and this event often sells out, so purchase yours early! Tickets are $25 and are non-refundable. For tickets, contact any Select Choir member. Don’t know a member?—contact Mrs. Jill Long in the Vocal Music Office at 315-597-3420 x1204. 1 Comment to "Pal-Mac Madrigal Dinner"